Because of the logistical challenges this workout experience presents, we will start the clock at 15 minutes after the hour in order to run 2 heats. Come in early if possible, warm up, and work with each other and your trainer! Review, set up, and practice movements for the workout. Notes: In this workout you move from each of five stations after a minute. The clock does not reset or stop between exercises. This is a five-minute round from which a one-minute break is allowed before repeating. 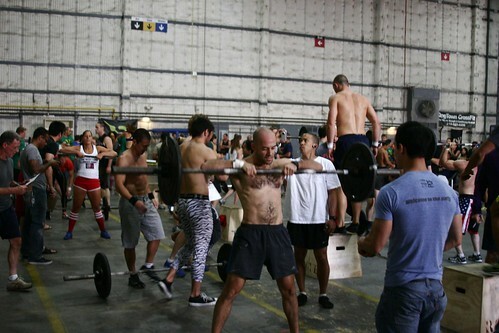 On call of ‘rotate’, the athletes must move to next station immediately for best score. One point is given for each rep, except on the rower where each calorie is one point. ‘Fight Gone Bad!’ was my first ever CrossFit workout. There were no On Ramps or beginner classes back then. They told me how to do it, what the stations were, and I went to work with no idea what I was in for. I remember they gave me a lighter ball, lower target, lower box, lighter weights, and despite all that I got a whopping score of 157 reps. It was hell, and I was in pain such that I could not recall ever being in until that point. After the first round I thought I was going to die. The second round I had nothing left BUT I remember having a desperate burst of energy during the Wall Balls and the trainer was worried about me. I do not remember the third round. Afterwards, I laid on the floor until we had to go inside, where I laid on the floor again. This is three rounds of gut checking, heart breaking mayhem. It is also a considerable logistical challenge! We purposely left out the warm up for the purpose of running 2 heats to have partners, with clock starting 15 minutes after class start. Get in, get warm, work with each other, and get some!